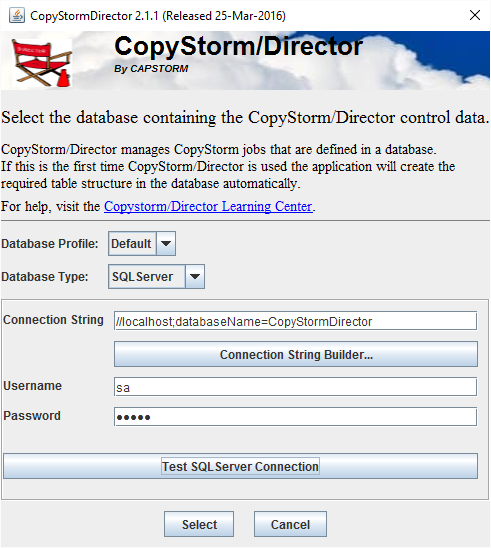 When CopyStorm/Director is launched it will always require credentials for its corresponding database. CopyStorm/Director will automatically remember the most recently used credentials for the current user. The most recently used credentials are encrypted and stored in the file $HOME/.capstorm/CopyStormDirector.properties. Encryption is performed using DES-256 with an unpublished secret key. Must be able to create/alter tables and views. Must be able to insert/update/delete/select from any table/view created. CopyStorm/Director automatically creates the necessary schema if it is missing.